Shin Joog-Mok, FKTA chairman in an interview with The Seoul Times at his office in Seoul. Newly inaugurated Chairman Shin Joog-Mok of the Federation of Korea Tourism Association (FKTA) is ambitious about promoting the tourism industry of Korea. As an expert who spent three decades in the tour and travel industry, Shin is well-connected to both local and international sources of tourism, according to many leaders of this field. 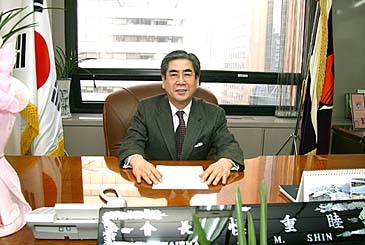 Mr. Shin was officially inaugurated as KFTA chairman on Dec. 1, 2006 in a unanimous vote of KFTA delegates. 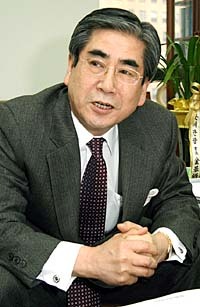 He began his career in tourism as president of a tour promotion corporation in 1980, fast becoming a leader of major tourism associations in Korea. Well-versed in the internal affairs of Korea's tourism industry, for four years Chairman Shin has been agonizing over how to solve the chronic problems that face local tourism, especially how to elevate its status and improve its promotion. In a recent interview with The Seoul Times, Chairman Shin revealed various plans of FKTA in order to improve worker rights for some 4 million people in the industry, and to secure benefits for an estimated 15,000 tour and travel related businesses. For one thing, Chairman Shin expressed hope that the tourism bureau of the Ministry of Culture and Tourism, will eventually be separated from the ministry to become an independent ministry in charge of tourism affairs in the near future.. He also expressed his volition to reduce the Tourism Development Promotion Fund to a very low rate in order to make it more available to those working in tourism. Chairman Shin's larger plans include utilizing the "Korean wave" of pop culture which has overcome Asia, to create a better image of Korea all over the world. He thinks that this will generate more profits for Korean tourism, from the overseas tour industry. The Korean wave, locally dubbed "Hallyu," refers to the popularity of South Korean popular culture, especially Korean TV dramas, in Japan and other Asian countries. It is often likened to the "British Invasion." Q1: First of all, The Seoul Times would like to offer sincere congratulations on your inauguration as the 23rd president of FKTA. What do you think about your FKTA presidency? Could you reveal your plans to lead FKTA for the next three years? A1: I had tried my best for this position for the last four years. Even though tourism is one of the core industries in the nation, the estimated 4 million people involved in this line of business are not treated fairly enough. So, I will do my utmost to upgrade the rights and benefits of these people. I will also bolster the status of our FKTA. Q2: Could you tell us the organization of your FKTA (Federation of Korea Tourism Association) and the status and role of it? A2: Established in 1963 FKTA represents all South Koreas' tour and travel industry and coordinates the opinions of all the members for the benefits of its members. Also, FKTA is involved in a variety of tourism related activities. FKTA has 16 regional chapters around the country. Q3: As we understand, you have maintained that the tourism part of the Ministry of Culture and Tourism should be separated and promoted to the level of ministry. In addition, you have emphasized the importance of systematic research and study of local tourism industry and the need for educating professionals in tourism industry. What specific plans do you have to realize these goals? A3: Tourism industry, in my term, is "invisible" and gigantic industry. Accordingly, the government needs to manage the industry systematically. Now is the time we should elevate it to the level of ministry under the direct supervision of the prime minister. I am seeking ways to achieve this through the consultation with the National Assembly members. In addition, I will demand for the rights for using the Tourism Development Promotion Fund. The fund has been offered to only Korean Tourism Organization (KTO). But I will see what I can do for the fund to be used for our organization and for our members as well. As part of our ways of improving FKTA status I will try to make parts of departure tax to be used for FKTA. I would also like to set up a fund for the people involved in tourism industry so that they can get loans from it easier than from the commercial banks. Q4: South Korea 's entertainment industry is making am impressive dent in the world particularly in South East Asian countries. Korean dramas, popular songs, and films, so called "Hallyu" or "Korean wave" is hugely popular in Japan and other Asian countries. How would you use "Hallyu" to promote Korean tourism industry overseas? A4: A number of Japanese ladies pour into South Korea to meet with the nation's best-known Hallyu star actor Bae Yong-Joon, who is is affectionately called Yonsama in Japan. If this phenomenon continues Korea will earn tons of money from the foreign tourists, I mean Japanese women in particular. They are visiting locations of "Winter Sonata" in which Yonsama starred. This will boost national image of Korea overseas. 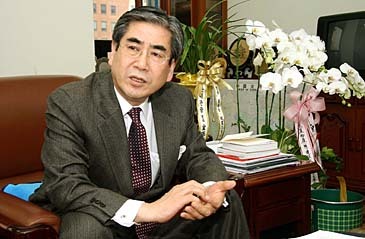 Q5: As president of Korea Travel Fair (KOTFA), you have been hosting Korea World Travel Fair annually. What is the fair all about? How does this yearly event contribute to the development of tourism industry? A5: Korea World Travel Fair is the nation's largest travel fair which attracts a lot of attention from overseas. It started in 1986 and secured its position as the most representative travel and cultural event in the country. It is aimed at providing new travel and tourism ideas to the consumers and the industry people alike. We aim to activate tourism for both in and outbound travelers with the Korea World Travel Fair. For these goals we will closely cooperate with the Korean Tourism Organization (KTO). For the year 2006 the Korea World Travel Fair was held from June 8 through June 11 at the Atlantic Hall on the third floor of the CoEx (convention and exhibition) in Samsung-dong. Estimated 380 travel agents and organizations from 50 countries in the world took part in the fair. Over 80,000 general public also visited the fair, making the event a huge success. Q6: You have involved yourself in tourism industry for the last 30 years. Could you tell us about your experience and career in this line of business? As I heard about you, you were awarded with many citations and awards for your meritorious deeds. A6: I started my career in this industry with my own company in 1980. I still serve as president of Korea Tourism Promotion Co. 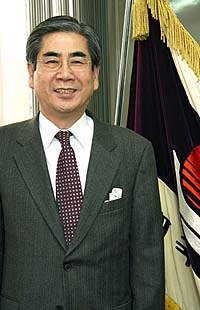 In 1988, I was appointed as the president of The Korea Tourism Research Institute and served for the institute for two years. Four years later I became the chairman of Korea Travel Fair (KOTFA)'s organization committee, which title I still hold. From 2000 I served as an auditor of Federation of Korea Tourism Association (FKTA) for three years. Now I am the FKTA chairman. I also head the Korean Tourism Pension Industry Association. I was elected as its president in 2004. I was so lucky that I was recommended for many citations and awards including from president, prime minister, transportation minister, culture minister, Australian government (Koala Prize), and Taiwanese government. In my effort to pass my knowledge and experience on tourism to the younger generation I recently authored an autobiography "Tourism Industry Will Determine the Future."